Electricity forms the core of almost everything we do as a society. For this reason, an electrician company must respond quickly when a customer has an electrical issue. A quick response will not only allow your clients to get on with their lives, but can also prevent potential electrical fires or damage as a result of a faulty electric system. Smart Service, an electrician dispatch software, instantly connects the dispatchers in your office to your electricians out in the field. This software allows dispatchers to schedule service jobs immediately, delivering services to your customers more quickly and efficiently. This electrician dispatch software allows your dispatchers to pull up records of previous appointments, locate field technicians, and manage equipment. Electrician dispatch software will save your company time across the board and help you take care of customers faster. When a customer calls the office, they want to either schedule a new service appointment or inquire about the location of their electrician. Smart Service, an electrician dispatch software, gives you the power to keep job notes and old service records in one, integrated database. Your dispatcher can easily pull up these files while on the phone with a customer and edit them as new information comes in. Electrician dispatch software eliminates the need to leave the client on hold and also keeps your dispatcher from scrambling through endless files and paperwork to find what they need. Your dispatchers can immediately run through a client’s previous history and fully understand the nature of their situation. If any previous jobs relate to the current request, your dispatcher will quickly make the connection. This feature can also help dispatchers assign your best electrician for each job. Electricians can pull up the job notes on their iFleet mobile app and understand the entire scope of the project before they even set foot inside the customer’s home. Customers hate waiting on hold when scheduling any service appointment. Smart Service, an electrician dispatch software, removes this frustration by integrating with QuickBooks and your existing customer information in one seamless system. With a few clicks, dispatchers can pull up a work calendar that syncs company-wide. Dispatchers can instantly find openings in the schedule and add the new appointment immediately. Eliminate the guesswork involved in finding an available electrician. 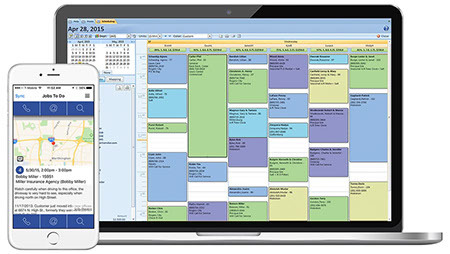 Smart Service removes the hassle and syncs new appointments across all company devices. Other dispatchers will see this change in the schedule, allowing them to avoid overlaps or double bookings. Electricians will receive the change on their mobile device while out in the field and will immediately become aware of new stops or changes to their routes. For emergency same-day appointments, dispatchers can see what electricians have free time slots and quickly schedule the new job. Dispatchers can also locate electricians using the GPS on their iFleet mobile workforce app, assigning work to the technicians closest to the new job. These features will save your company hours of wasted time and improve efficiency across the board. Equipment management represents another important aspect of an electrician service company. With the unique nature of electrical jobs, workers need a diverse set of tools for each appointment. In a productive electrical service business, your technicians commonly borrow company equipment to complete their assigned jobs. How do you currently track these assets? Without a system in place, your equipment can get lost or even stolen. If electricians need certain vehicles or tools for a specific job, your dispatchers should have an idea when workers check out those items. With Smart Service, you can track your vehicles and equipment. Dispatchers will immediately know who has the equipment and when it will become available again. With this information, they can schedule their next appointment and assign the equipment needed for that job. Electrician dispatch software accounts for all your equipment. With software, dispatchers will have the power to set up appointments based on availability. Dispatchers can also add line items to the work order for equipment that will permanently stay at the job site. Let Smart Service eliminate wasted time and improve efficiency in your electrician service business. Request a free demo of our electrician dispatch software today!